In my life there are happy peppers and sad peppers. At a first sight they look quite the same, but they are false brothers. The sad peppers are those found in the supermarket shelves in the winter, slightly fibrous glasshouse monsters devoid of any flavor and scent. I use them sometime, just out of boredom of cabbages. However they are always disappointing despite my efforts to put some personality in them. The happy peppers are summer fruits through and through. They are juicy, sweet, aromatic and deliciously textured especially when roasted in the oven and even better in a BBQ. I so look forward to their appearance in the market! This is one of my mum’s classic recipes, so simple and always popular as an appetizer or light vegetarian meal. It works very well with gluten-free breadcrumbs and I would not be opposed to cooked quinoa or other alternative small grains if you need to avoid wheat. It’s great party food as they are delicious at room temperature too. And of course they make a great night snack if it’s too hot to sleep :). Prepare a basic tomato sauce with 1 onion, a 400 g (12 oz) tin of San marzano tomatoes and a splash of white wine. Grill 3-4 whole peppers on a BBQ rack or under a preheated broiler, until skins start to blister. You need to grill them quickly as you only want to burn the skin away, the peppers should be hardly cooked otherwise they will fall apart and yu won’t be able to make the rolls. Transfer the peppers into a paper bag or wrap with several layers of kitchen paper, then let them stand until cool enough to handle. Peel the peppers, then halve lengthwise, discarding stems and seeds. Peppers may be prepared up to this point 1 day ahead and refrigerated. In a bowl mix the stuffing ingredients with a 1-2 tablespoon tomato sauce until the stuffing looks moist but not wet. Make sure to reserve some of the sauce for topping the rolls. Top the half pepper slices with the stuffing, arranging it in 1 cm (1/2 inch) layer. Roll up each slice to enclose the bread mixture. Transfer the rolls in an oiled ovenproof pan where they should fit tightly so they will not unroll during cooking. You might use cocktail sticks to secure the rolls. 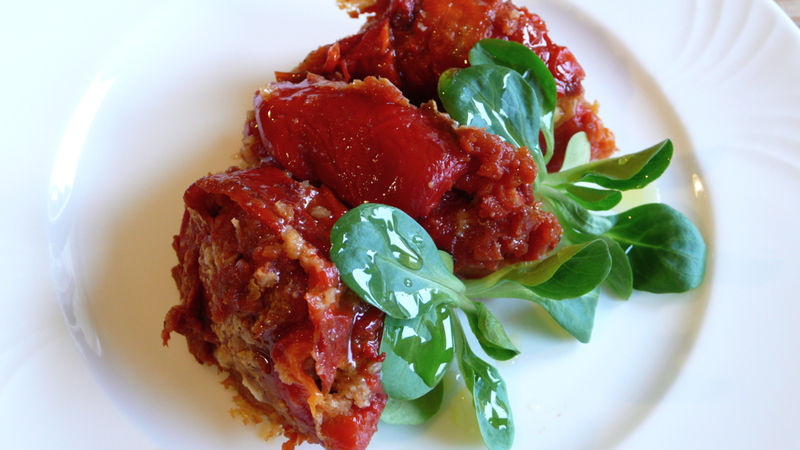 Spoon a thin layer of tomato sauce over the rolls and sprinkle with Parmesan. Don’t drown them in sauce! Broil for 10-15 min. until the cheese is melted and the sauce is slightly simmering. Serve warm – not hot – or at room temperature. If using large peppers, cut each roll crosswise in two to serve. A very handy dish, great for an antipasto or un primo. Looks so fresh. What a lovely idea, Letizia! Of course I make stuffed peppers all the time, but these rolls sound even better. Must try them! Looks really good Letizia! Gotta try this recipe!